P!nk performing at Scottrade Center in Saint Louis Wednesday. Photo by Sean Derrick/Thyrd Eye Photography. Pop sensation P!nk, fresh into her 40-date U.S. Beautiful Trauma Tour in support of her new album by the same name, performed at a jam-packed Scotttrade Center Wednesday evening. The resulting show was a dazzling display of acrobatics, theatrical composition, an intensely torrid dance routine with Khasan (one of her dancers) 20 feet in the air dangling from a pair of ropes, and powerful vocals throughout. The mistakes actually made that raw feeling come out in the open a bit more, and gave it a real feeling, as opposed to a perfectly polished show ran by robots. She took the issues in stride and endeared her to the fans that much more (is that possible?) with her down-to-earth attitude. Never one to shy away from speaking her mind many of P!nk’s songs deal with very human issues, women empowerment, human rights, various socio-economic issues, personal struggles, and dealing out uplifting messages to her fans. She has an amazing way of transmitting that message without appearing too serious or coming off as gloomy. Rather, her songs and shows are uplifting and fun, while still getting the messages across that she wants. At one point her hard rock persona came out when she covered the Nirvana classic “Smells Like Teen Spirit”, minus the garbled vocals, wearing a green plaid robe. That is about as grungy as she gets nowadays. She also rocked out to her hits “Funhouse”, which delved into a cover of No Doubt’s “Just a Girl”, and “So What” in which she soared high above the arena crowd, dipping in and as close as one could get without touching so her fans even in the cheap seats could get a close up view. Throughout the night P!nk’s vocals were strong even as she soared high above the crowd. Yes the vocals were hers and not pre-recorded as you could hear the little inflections that come only from a live performance. Her stage setup was huge, with the light rigging nearly encroaching the Blues’ scoreboard high above center ice. There were multiple set changes including one during “Try” where the set transformed into a creepy almost enchanted forest setup, complete with dancers dressed as demons, birds and foxes. 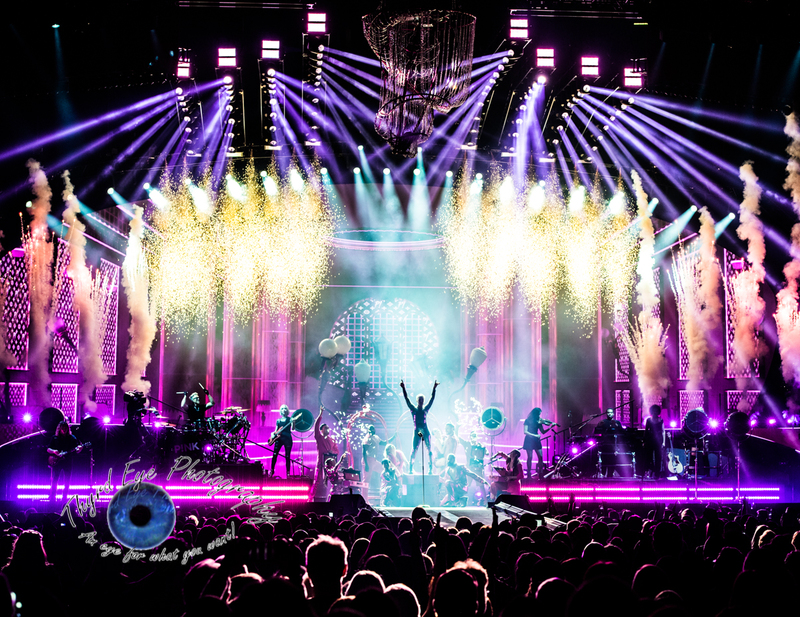 The stage was immersed in a 3D feel (I half expected P!nk to make it rain in the building during part of the show. The lighting was dynamic and rich, the costume changes were plentiful and helped keep the show fresh, the band (with longtime members guitarist Justin Derrico, bassist Eva Gardner and drummer Mark Schulman) was tight, and dancers were spot on. I didn’t think she could outdo her Truth About Love Tour from 2013, but she has done so and more. This is certainly a tour not to miss. Be sure to check out the photo gallery after the Setlist. Mark Schulman performing with P!nk at Scottrade Center in Saint Louis Wednesday. Photo by Sean Derrick/Thyrd Eye Photography.